Tomato Patch: Soil secrets revealed! Do you know what your blood pressure is—and what the calcium level of your garden soil is? Most of us have a good idea about our basic body statistics—but quite a few of us haven’t the slightest idea about the state of our garden soil. Shame, shame, gardeners—and that included me until four weeks ago. If you’ve read my earlier postings, you know that I’ve had a problem in my Tomato Patch with blossom-end rot. Last summer the disease, which stunts the fruit and makes most of it inedible, severely affected my paste-type tomato plants, including Super Marzano and Big Mama varieties. Blossom-end rot essentially is a calcium problem—either an insufficient supply of calcium in the soil or not enough moisture for the calcium to go from soil to plant to fruit. When I planted my tomatoes last May, I mixed a tablespoon or two of pulverized lime, a good source of calcium, into each planting hole, added some water to start dissolving the lime, and then drip-irritated the plants over the growing season. My theory: Tomato plants plus calcium plus water equals perfect fruit. My reality: Blossom-end rot affected nearly every paste tomato. I’m not a screamer, but blossom-end rot frustrates me, and my nature is to solve a problem. That’s why I decided to go back to square one of good gardening practice and test our garden soil so I know what I’ve got to work with and how I might make changes that result in even better crops. I started my quest for a soil test by reading the University of Maryland Extension’s short brochure, “Selecting and Using a Soil Testing Laboratory,” which explains the value of soil tests and at the end lists six soil-testing laboratories and their offerings. To see the Extension’s brochure, CLICK HERE. When I saw that a basic test would identify the calcium level in the soil, I almost shouted “Yes!”—but I’m not a shouter either—because that result would answer a basic question I had about my blossom-end rot problem—is our soil calcium deficient? I reviewed the offerings of the six laboratories and chose the University of Delaware Soil Testing Laboratory, though the labs all offer comparative services. I went online and used a credit card to order two of their testing kits—because we have a series of small garden plots wrapping around the crest of our hill, and I wanted to separately test two separate areas to see if they differed significantly. Each test was $10. Drum roll! Calcium deficiency—yes or no? 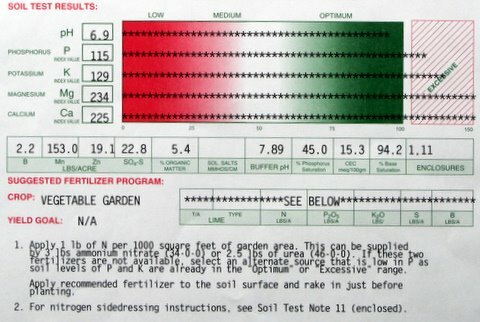 I scanned down the list to “Ca” and saw that the calcium level in both areas of the garden is—I was surprised—excessive! “Excessive” in this case doesn’t mean the calcium level is a problem. It means I shouldn’t add more. The two tests also show pH levels are “Optimum.” Phosphorus (P), potassium (K), and magnesium (Mg) levels also are more than sufficient. Overall, the two tests show the soil in the two garden areas vary little. Enclosed brochures explained the various results. 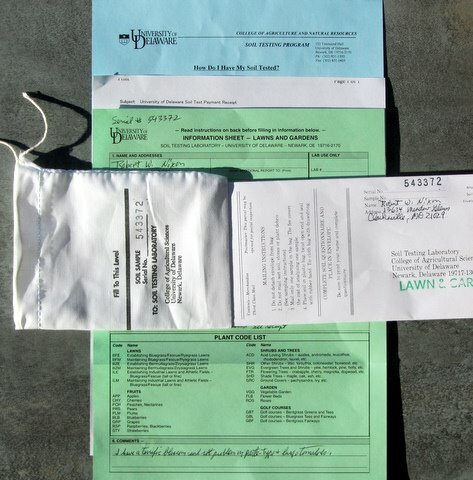 At the bottom of each report is a “Suggested Fertilizer Program” based on test results: Apply one pound of a nitrogen-only (no phosphorus or potassium, because we already have plenty) fertilizer per 1000 square feet of garden area. Two examples are given: 3 pounds of ammonium nitrate (34-0-0) or 2.5 pounds of urea (46-0-0). Is my blossom-end rot problem solved? Probably not, but I’m smarter now. I know the soil doesn’t have a calcium deficiency problem. If I water properly, there should be no moisture problem. But there’s still another possible tweak: Can I find a paste-type tomato variety that is blossom-end rot resistant? I’ve been searching the internet and asking other gardeners for recommendations and haven’t found a list, though I’ve read several reports that the small Juliet hybrid is highly resistant—but its small size isn’t popular with kitchen canners. I’ve also read the standard-size Amish Paste variety has some resistance, and I’ve already purchased a packet of Amish Paste seeds to try this summer. The challenges of vegetable gardening keep me researching and learning—something good, I think, for the gray matter of this Ancient Gardener. I’ll let you know as the summer unfolds and my Amish Paste tomatoes grow, bloom, and fruit whether I’ve solved this annoying problem. What do you know about your garden soil? Isn’t it time to have it tested? The Federle is another good variety from Seeds From Italy you may be successful with. Good luck! We have the same problem than Bob, we tested our soil and we had the same result than Bob. When, Donna and me, teach a class about gardening, we mention the blossom-end-root problem. In most case, the problem is more caused by dryness than a lack of calcium. Tomatoes like a constant moist soil. The problem is more visible in July than in September…. I had blossom end rot on my watermelons (the tomato blossoms mostly just shriveled up and turned black in the excessive heat). I think it had to do with the weather over the summer going between desert and monsoon on a very irregular basis.